Trying to switch to decimal time. 10 dours, 100 dinutes, 100 deconds. Check out the DeciTime app. It's 2:60. I really should go to bed. Maybe I'll get 3 dours of decimal sleep. On stage tomorrow night at 8:75. Today we went to Star Trek: The Exhibition at the Tech Museum in San Jose. My captain is more interested in the later series, especially Voyager, while her first officer prefers the earlier shows. We sat in the captain's chair and stood on the transporter pad while watching ourselves dissolve on the monitor. I saw several different PADDs there, from various centuries, and noted their resemblance to the new iPad, and the smaller ones resembled the iPhone I carried with me. The communicators reminded me of flip phones, although in function they are more like satellite phones. And scattered around the exhibit were LARS displays, including an entire corridor, but no matter how much I tapped the screens, I got no response from the ship's computer. Nor did the jelly beans on the TOS bridge do anything. Oh, well. There was also a large display of a timeline, with separate sections for each series and movie, starting the 20th century, and mentioning the return to the moon during the 21st century by the Constellation Program. Oops! I guess this was an alternate universe where Obama did not cancel Constellation. I only noticed year numbers, no stardates, although I did not pay that much attention, since I'm already familiar with Star Trek chronology, and I was more interested in examining props than reading a bunch of stuff that I can get online. I did try jumping through the Guardian of Forever to past centuries, but found only this one on the other side, and no Joan Collins. Yesterday I saw the movie Alice in Wonderland and I noticed the price tag on the Mad Hatter's hat said "10/6". I recognized that it was a price in old English currency of ten shillings and six pence. Since there were twenty shillings in a pound and twelve pence in a shilling, 10s 6d would today be equivalent to 52½p or £0.525, although halfpennies stop being minted in 1984. That got me thinking of duodecimal measures. 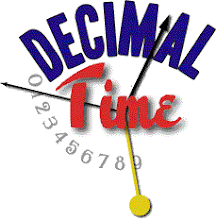 The words "inch" and "ounce" both come from the Latin uncia, meaning a twelfth part, and there are twelve inches in a foot, and twelve troy ounces in a troy pound, although other types of ounces no longer represent a twelfth of anything. Years are divided into twelve months. Originally sun dials divided the period of daylight into twelve hours, which varied in length depending on location and time of year, but eventually mechanical clocks came to represent periods between midday (noon) and midnight, and these clocks are divided into twelve hours of equal length. An additional hand likewise divides each hour into twelve parts; adding marks between the numerals multiplies this division by five, giving 60 minutes, but have you ever noticed that the time is almost always rounded to the nearest multiple of five minutes, so we're still dividing hours by twelve? A dozenal system of units would be fine, and in some ways better than decimal, but traditionally there have been only a handful of dozenal units. A shilling were divided into twelve pence, but a penny was divided into two ha'pennies or four farthings, a pound into twenty shillings, etc. Since Decimal Day, 1971 February 15 (MJD 40997), a pound is divided into 100p, period. I posted before about the French Republican Calendar iPhone app called Calendrier. It seems that it has been updated. Originally it used a calculation that skipped a leap year every 128 years, so that all Republican years between 128 and 256 (1919 and 2047 CE) start on September 23. Version 1.2, released 2010 March 4 (MJD 55259/14 Ventôse an CCXVIII) has all years starting on the autumnal equinox in Paris, as during the French Revolution, with an option to display the current date according to Romme's Gregorian-style proposal to skip leap days on most century years. (Romme went to the guillotine before it could be adopted.) Under Romme's plan, all years between 200 and 300 (1991 and 2091 CE) start on September 22. Under the original rule, all years between 141 and 300 (1932 and 2091 CE) start on either September 22 or 23. The app also now converts Gregorian dates between 1792 and 2195 CE (1 and 404 ER) to Republican dates, although apparently only by the equinoctial rule. (Not sure why the Gregorian months appear to be in Spanish.) Now I'm actually tempted to pay $1.99 for it! Primidi 21 Ventôse an CCXVIII à 3hd 86md t.m.P. This week's episode of Nova on PBS, "The Pluto Files", reminded me of a story. It was around the beginning of a new century, and an astronomer was predicting that a planet existed which had yet to be discovered, and he organized a search for that planet. An object was observed and declared to be a new planet. However, the new planet was quite small, and other objects were later found to orbit in roughly the same part of the solar system, so after half a century or so, a large number of astronomers stopped calling it a planet. Then, in 2006, a proposal was made to the International Astronomical Union that would have included it as a planet, but this was rejected because it shared its region of space with other objects, so it became reclassified as a "dwarf planet".